The Science of Sound. Language and images collide in Laurie Anderson's 'Delusion,' the performance artist's new work presented at Zellerbach Hall on Saturday night. Excerpts from Sam Stander's interview with Laurie Anderson about her new show, "Delusion." 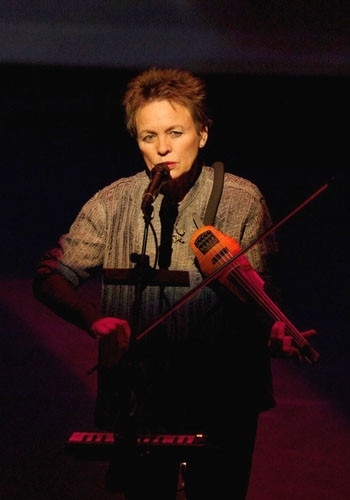 On a sparsely furnished Zellerbach Hall stage, armed with her skeletal violin, Laurie Anderson looked like the last player left after the orchestra had wandered off. But on Saturday, as she orated and played her way through her latest performance piece, "Delusion," she exuded nothing but accomplished mastery. Commissioned for the Vancouver 2010 Cultural Olympiad, the work develops Anderson's career-long fascination with language and persona. Since before her 1982 debut record Big Science, she's been fusing spoken-word storytelling with singing and experimental electronics. Here, she recounts dreams and treats various broader themes, switching between her natural voice and a booming masculine vocal filter named Fenway Bergamot. "Delusion" shares some content with her upcoming album, Homeland, but it began its life in play form. "I thought, I'm going to try to write a play," she recalled, speaking a couple days before the performance, "because I was working with a lot of sort of jump-cut type material, and I thought, how is that going to sound as a language where two people aren't quite connecting as a conversation?" Anderson refers to the approximately 20 short stories in "Delusion" as "mystery plays," parables that treat a topic without resolving it. These segments comment on each other, but not always in explicit ways. Much of the verbal content is reinforced with video imagery projected on various screens. Anderson calls this electronic puppetry, which she says is "an elaborate way of saying just using different cameras in different ways, and how they expand or contract scale and point of view." A paraphrase from Melville early in the work kicks off a thread of arcane intertextuality. Anderson muses extensively on grand narratives, ranging from mythological sagas to the driving impulse behind recent historical moments. This fascination leads her to the weird "lunar landscape" depicted in the Icelandic novel "Independent People" by Halldor Laxness; elsewhere, the focus is on the mystic roots of the Russian space program, conceived 150 years ago by Nikolai Federov as a means of resurrecting dead ancestors. Gradually, a lineage emerges, of wild intellectual exploration through dreams, books and outer space, all leading up to Anderson. The most affecting parts of the work involve the death of the Anderson-character's mother, presumably Anderson's own. Reflections on how to say a final goodbye to a mother she doesn't love provide a crushing emotional counterpoint to the piece's loftier tangents. Besides Anderson's vocals and violin, both subject to electronic manipulation, the performance is accompanied by electronic tones and occasional bursting beats, seemingly routed through a laptop onstage. At intervals, she was joined Saturday by virtuoso horn players Colin Stetson and Doug Wieselman, whose playing ranged from staccato whimsy to wailing intensity. "Both of them are composers. I tend to work with composers," Anderson enthused. "I just kind of go, 'Well, play what you want there for thirty seconds,' and they do. And it's different every time, and that's what's fun for me. We create a musical language and they work within it." Anderson's performance was disarming, finding the sweet spot where video installation and reading meet to produce a modern classical concert. Always inspiring awe after three decades, Anderson's ingenuity marches on. The Daily Cal encourages readers to voice their opinions respectfully in regards to both the readers and writers of The Daily Californian. Comments are not pre-moderated, but may be removed if deemed to be in violation of this policy. Comments should remain on topic, concerning the article or blog post to which they are connected. Brevity is encouraged. Posting under a pseudonym is discouraged, but permitted. Click here to read the full comment policy. Copyright © 2010 The Daily Californian. All rights reserved.